Sending out Christmas cards is one of my favorite things to do every year. I always order them way in advance and have them addressed and stamped before Thanksgiving, ready to send out. This year is no different! 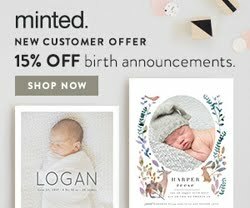 I've ordered our cards from Minted for the past couple of years, as you probably already know from reading my blog. I've collaborated with them on a few giveaways in the past, which has been awesome because I would be using them anyway so why not also be a sponsor and be able to give something back to my readers? This year, I was able to splurge on upgraded recycled paper and red backing (instead of plain white) and I love how they turned out! We didn't take special Christmas pictures; I just used the ones we took in August during our family photo shoot. 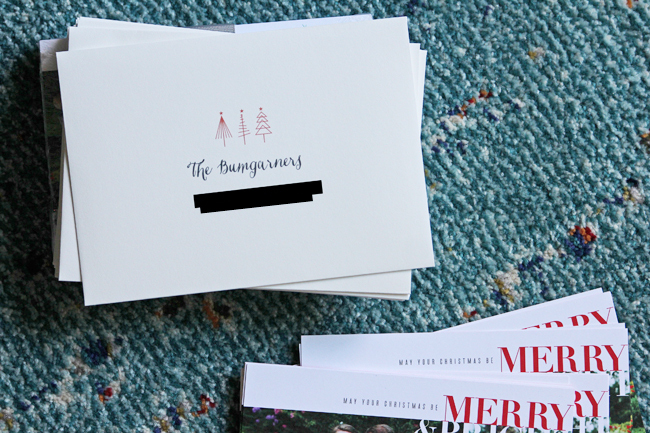 My absolute favorite part of getting Christmas cards at Minted is the free address printing. * SO CUTE. They have all different styles and colors, many of which match directly with the card design. 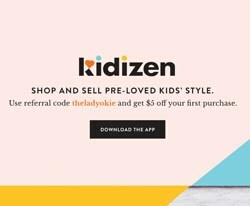 I happen to know that they will have some killer deals coming up during Black Friday and Cyber Monday with some of their deepest discounts of the year! 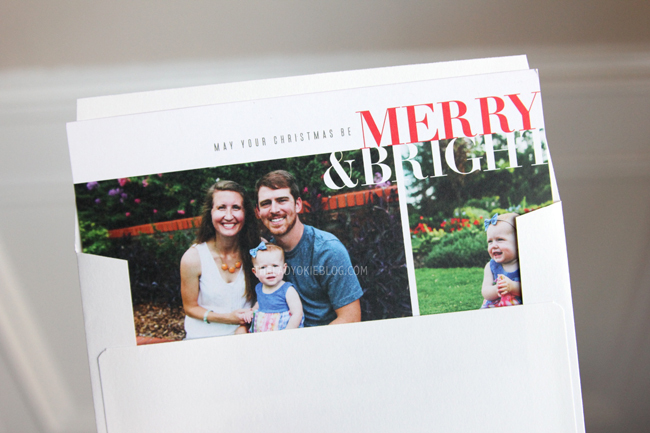 If you haven't ordered your cards yet, check out the selection at Minted. I guarantee you will find something you love that you won't see anywhere else this holiday season. *While we are on the subject of addresses, PLEASE FOR THE LOVE OF APOSTROPHES DO NOT PUT AN APOSTROPHE IN LAST NAMES THAT YOU ARE MAKING PLURAL. Example: The Bumgarners = correct. The Bumgarner's = incorrect. Seeing apostrophes in plural last names puts me into a bit of a rage, so just don't be that person. I'm more than happy to clarify this point if it's at all confusing to you. There are no stupid questions, but there are stupid apostrophes in the wrong places. Yes, yes, yes! 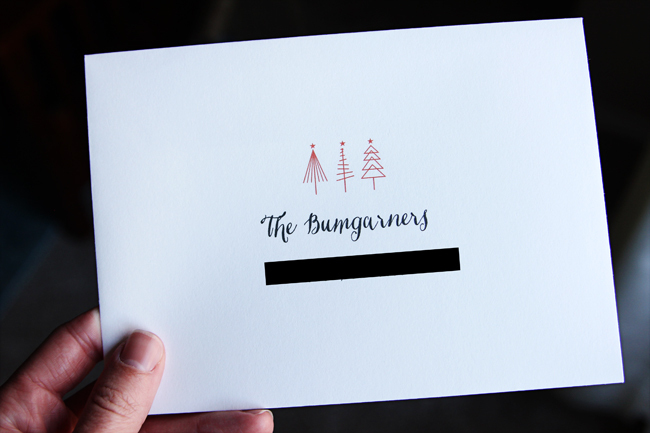 Last week I was teaching my students the difference between Bumgarner's, Bumgarners', and Bumgarners... well, without using your last name. However, that is where my connection with this post ends. Two years ago I sent out my Christmas cards during the summer (6 months late). Last year they were on time but I was off work from October to January thanks to a major surgery and couldn't really move off the couch. THE APOSTROPHES KILL ME. Your card, however, is adorable! I always love their selection, but never want to pay full price, so I'll have to check them out on Black Friday!! :) Yours turned out so cute! Hahaha, I, too, am an apostrophe snob :) It drives me insane to hang a grammatically incorrect Xmas card. Lol. Yours are too cute! I need to get mine ordered soon so I can send them out on Dec. 1st! These are beautiful!! And I didn't know about the free address printing! I cannot STAND those stupid apostrophes. EVERY YEAR I see this and if I didn't care about preserving relationships I would tell each and every person that their card looks stupid because of it. Your cards are adorable! I just ordered mine from TinyPrints yesterday! I had to laugh so hard at your apostrophe comment at the end!!! Love the way your cards turned out!! I have used Minted before, they are great. They look great!! We got our Minted cards a few weeks ago and I'm ready to send them out this week. They take so long from Hawaii so I think I''ll just send them out tomorrow. My last name has always ended in an S - I went from Martines to Chambers. I hate saying "The Chamberses" because I think it looks ridiculous, so I usually just say Carolann & Nick. The worst is when someone's custom-made sign (that was probably a wedding gift) is hanging in a prominent place in their home and says, "The Thumbnacker's: est. 2011." The agony. And I'm sure half of these people know it's wrong, but even I would feel obligated to display it. HA! I love your comment at the end. I totally understand what you are saying. Though I have a question for you. If the person's last name ends in an S, what do you do to make it plural? I've looked it up before (on random internet sites instead of a reputable source, haha) and I can't find a solid answer. Usually I just address those cards to "The ____s Family" instead of trying to figure out the proper plural. Ha! So, the ___ Family compromise is perfect if you don't know what to do :) But for the record, add "es" to any name that ends with s if you are making it plural. Or the Jones Family would become the Joneses. Super easy but for some reason people get really confused! I think mostly they don't like how it looks. Laughing so hard at the *! I struggle with putting The Adamses, since that's the correct way so I always put "The Adams Family." I was just teaching about apostrophes and names and plural names last week! It's important info to know! 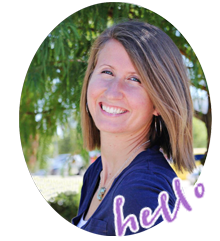 Your cards turned out really cute, and the address printing style is cute, too! All of our cards are ready and will probably be mailed in the next few days since the mail is slow-going trying to reach the other side of the world! I love your apostrophe rant. With a last name like Evans we have seen it all. We are not the Evan's, or the Evans', or even the Evans's! P.S: For Christmas, ask someone to get you a T-shirt that says "I am the grammarian about whom your mother warned you."